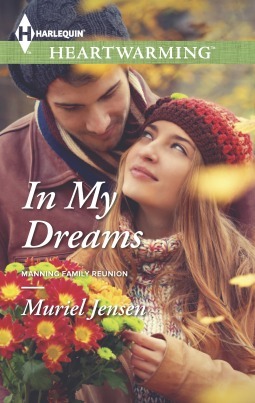 In My Dreams by Muriel Jensen attracted me because of the cover and the intriguing title. The blurb is again very interesting and had me picking up this book to read. This is the story of an ex-soldier, Jack who is searching for his biological sisters and a former Pediatric nurse, Sarah Reed. Both these people have faced traumas in their past that have shaped their present. While Sarah left her career behind following the death of a patient she blames herself of, Jack faced the harsh realities of battle and a traumatic event in his childhood separated him from his sisters. In this book, how these two broken souls help each other heal and find closure to their quest of happiness is beautifully shown by the author. I loved this book and connected with both Sarah and Jack. Jack's search for his long lost sisters had me praying for their reunion soon and Sarah's fears had me understanding her and empathizing with her. The romance between these two characters is beautifully and poignantly shown and had me rooting for a happy end for them. The added suspense and thrill of searching for Jack's biological family was another attraction of this story and had me glued to me seat throughout. The author's writing style is engaging and fluid and she brought the story to me right in my home, making me feel a part of all the action. The only issue that I had with this book is that the author doesn't give much time to developing Sarah and Jack's love story. They just sort of have an insta love which seemed a bit out of sorts because at one time Sarah is just a friend of Jack's brother and then suddenly she is helping Jack overcome his nightmares and behaving like a girlfriend! However, despite this, I loved these characters but had this aspect been developed properly I know the story would have been even more stunning! I loved Jack's brother through adoption and was intrigued by Jack's biological sister and look forward to reading their own stories. All in all, In My Dreams by Muriel Jensen is a touching and entertaining story of a man's search for his lost family, a woman's search for redemption and their poignant love story where they will not only heal each other but also finally forgive themselves. 4 out of 5 to it and recommended to all romance lovers.